The South African Navy (SA Navy) and its sea-going personnel are reaping double benefits as Exercise IBSAMAR VI 2018, the trilateral naval exercise between Brazil, India and South Africa, concludes its first sea phase. Following hot on the heels of Exercise ATLASUR XI the biennial maritime exercise between South Africa, Brazil and Uruguay, IBSAMAR commenced on 1 October, with the first sea phase taking place between 4 and 6 October in the False Bay area. The first sea phase is an integration phase, when the three navies familiarise themselves with each other. The second sea phase, from 9-11 October, increases the scale and level of complexity. As such, the exercises lined up until IBSAMAR concludes on 12 October includes force protection, anti-piracy, anti-air warfare, anti-submarine and anti-surface warfare exercises, surface firing, search and rescue and tactical procedures. 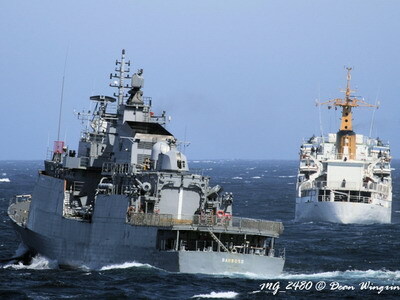 The very first exercise of Sea Phase 1, experienced by this defenceWeb writer whilst aboard SAS AMATOLA, occurred within minutes of departing the safety of Simon’s Town Naval Base, when the warship was attacked by two Namacura Harbour Patrol Boats mimicking Fast Incoming Attack Craft (FIAC), simulating an asymmetric threat when a departing vessel is at its most vulnerable. The warship mobilised its gun crews and weapons teams in order to deter, warn (and if required) neutralise the threat. Given the SA Navy’s ever-shrinking budget, keeping South Africa’s warships operational and giving her crews enough sea days to train, qualify and gain experience is an ever-increasing challenge. Thus, the SA Navy has welcomed the two maritime exercises and is using the opportunity to train new combat, navigator and engineering personnel to expand on the capacity within the South African Navy. A case in point is that aboard submarine SAS Manthatisi is a new submarine Commanding Officer in training. “You cannot have a better situation than this to really test him. One of the things for him is to operate under air threat, so we’re going to use the aircraft for that as well,” says van der Westhuizen. Officer Commanding of SAS Amatola, Captain (SAN) Cebo Gwala, continued that the exercise presents “a very valuable opportunity for the training of the Officer Commanding, where he is going to have to fare against a real threat that is not familiar to him. “But also for all the (surface ship) Watch Keepers, safety when operating near a submarine becomes paramount and the opportunity to exercise with one in close proximity and still stick to the basics of safety as laid down internationally and domestically is going to be a bonus compared to paper and/or simulators,” he explains. Exercise IBSAMAR also allows for the customary cross pollination of crew, in which senior personnel from each of the three services act as observers aboard the vessels of the other navies. Indeed, language issues have been identified as one of the key risks during the exercise. English is used as the communication medium, which can be challenging for countries which are not English-speaking. Another challenge, which all three navies are quick to acknowledge, is that of budget, or lack of it. The South African Navy (SAN), as the host country, is providing most of the participating assets. This includes the frigate SAS Amatola, hydrographic survey vessel SAS Protea which variously acts as support vessel and enemy, submarine SAS Manthatisi and the Maritime Reaction Squadron (boats, reaction force, divers and boarding party). The Indian Navy will be represented by the Kolkata class INS Kolkata stealthy guided missile destroyer with a Westland Sea King Mk.42B multirole helicopter and INS Tarkash, a Talwar-class frigate embarking a Ka-31 Helix B airborne early warning helicopter and a Marine force. Sadly, a P-8I long-range, multi-mission maritime patrol aircraft which was scheduled to take part was withdrawn shortly before the commencement of the exercise. Brazil is represented by the frigate BNS Barroso (with an AS350BA Ecureuil helicopter onboard) and 1 Platoon Special Forces. The South African Air Force (SAAF) will be providing a Super Lynx maritime helicopter, an Oryx transport helicopter, two Gripen fighters for anti-ship/anti-air warfare drills and a C-130BZ Hercules for maritime surveillance duties. The South African Military Health Service (SAMS) is represented by 1 Medical Task Group. Back in port for a few days after the conclusion of the first sea phase, the three navies are happy with the outcome.